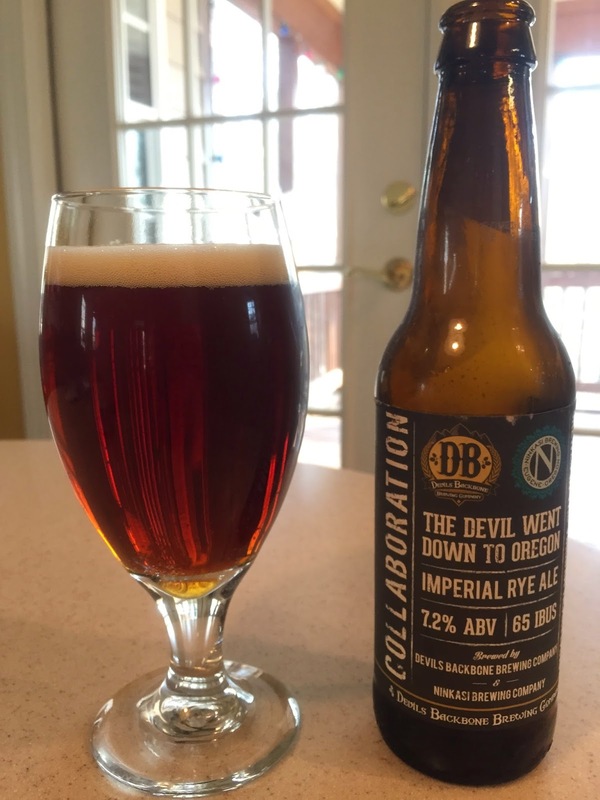 This is another of the beers in the March Collaboration Adventure Pack from Devils Backbone Brewing. I posted thoughts on another beer in the mix, Double Gooch IPA, previously. The Devil Went Down to Oregon Imperial Rye Ale is the result of a collaboration with Ninkasi Brewing Company of Eugene, Oregon. The Devil Went Down to Oregon pours an attractive dark amber color with a persistent beige head. The aroma is mild and a mix of caramel and dark fruit with a hint of grassiness. In the flavor you get a bit of sweetness at the start, followed by toasted malt and nuttiness. The rye adds notes of pepper and grass. There's a earthy undertone to the flavor profile. A very mild hop bitterness lingers in the finish. The mouthfeel is creamy and moderately "thick." This member of the Collaboration Pack is unique from the others in that the big hop flavors are not the main feature. The ale is more reminiscent of a English Brown Ale, but with a twist. It's a smooth, easy beer, and at 7.5% ABV, it goes down way too quickly. DB is awesome and they seem to have the midas touch. If you haven’t been to the brewpub, it’s worth the haul. I really like the 16 point IPA, but to be fair their Vienna Lager is growing on me for a “go to” beer for get togethers, etc. I too keep the Vienna Lager as an "easy" beer for gatherings. It's excellent. Enjoying some DB awesomeness - double gooch IPA. I really like BIG IPAs, and this one is up there with DB’s own 16 point IPA. Thanks for the tip! Glad to help. I enjoyed another myself the other night.